What makes a classic? Everyone has a different answer to this question; for myself, I think of something being "classic" when you can come back to it again and again over many years and still find something exciting, enjoyable and provocative about it. Like a great romance, they never really leave your heart - the proverbial "long and winding road"... Classic literature is easy to spot. The books that were a chore to complete in high school are, as an adult, page-turners full of nuance and beauty. I grudgingly completed Madame Bovary in my AP English class, but now it is one of my favorite books that I re-read every few years. Film is the same - we all know which films are given the "classic" label and can usually see why. But what about classics of one's own generation? Is it presumptuous to call something you grew up with a "classic"? The case in point is John Hughes' The Breakfast Club. I watched this movie again recently after many years of avoiding it's many censored editings on cable television, and found the original to be even more compelling than when I was young. Young? I was a child when I first saw this film. It hit the theatres in 1985, and I think I actually saw it in 1986 or 1987 during one of the first summers when I went to "overnight" camp. I was about 11 years old - 5th grade, I think. About 100 kids packed into a large rec room watching the breakfast club on a rather small TV. No one complained. For the first time I felt like I was seeing an adult movie, and it was the funniest thing I had ever seen. Now, a bit about John Hughes before I go too far. Of course, the entireHughes oeuvre of mid-eighties teen angst films are now over twenty years old and still just as fantastic as always. They are part of our lexicon, our zeitgeist even. Everyone of a certain age can quote entire scenes from these films and everyone has an opinion of their favorite. (While most would say Pretty in Pink or Ferris Bueller's Day Off, I'm still a big fan of Weird Science. Does that surprise you?) We watched them through high school when we had nothing else to do. In college they kept us entertained late-night when we had a belly-full of crappy beer and had to laugh it off. As adults, we still come back to them and they make us smile. Let's face it, the 1980s and 1990s would not have been the decades they were if it weren't for the films of suburban-Chicago-teenage life as explored by John Hughes. I grant you, at that first viewing of The Breakfast Club, a lot of it was way over my head. High school was some unimaginable continent that I never thought I'd reach at the time. I was fairly content in my world of shadow-plaid uniforms, soccer practice and piano lessons. The idea of wandering through massive hallways, answering to a bell and having a locker were beyond me. So, it is understandable that a lot of the nuance in The Breakfast Club is only just coming to me now. Don't get me wrong, I have the film memorized - seriously, word for word. I know every detail of the thin, art-deco-1980s font in the opening credits, to the rosy-pink shade of Molly Ringwald's nailpolish when she folds her diamond earring in Judd Nelson's gloved hand at the end. And don't even get me started on Don't You(Forget About Me) by Simple Minds - let's just say it was the soundtrack to an entire decade of my life. But during my recent viewing there was something I noticed that I hadn't bothered with before: the quote from David Bowie's Changes that starts the film. "And these children that you spit on/As they try to change their worlds/Are immune to your consultations/They're quite aware of what they're going through..."
When I first saw the film I didn't know who David Bowie was, much less know the song being quoted. (We were a Henri Mancini/Burt Bachrach kind of family.) Seeing it now made my heart pound. All the times I've listened to Changes and never realized how perfectly it applies to the high school experience. It's true that at my first viewing of The Breakfast Club I didn't understand a lot of the dialogue, but found the retorts and zingers incredibly funny and entertaining. Just what is a "neo-maxie-zoom-dweebie" anyways? I was forced to catch up on a lot of the new vocabulary though. I'd never heard of calling someone "a defective", and I was completely lost on the meaning of "tease". I didn't know what a "lobotomy" was, nor "anarchy", nor a "varsity letterman"...and as far as I knew, a "cherry" was a fruit I didn't really like. I thought Molly Ringwald's still incomprehensible line: "like this whole big monster deal - it's enless as a total drag," was the epitome of clever-coolness, and I loved it. It wasn't until I got a little older that I began to understand what these quips and verbal slams actually were, just as I began to understand all of those incredibly racy things Judd Nelson says to Molly Ringwald. My hormones had been lying dormant until: "...Calvins in a ball on the front seat, past eleven on a school night..." Comprehension was beyond me, but I knew I wanted him to keep talking. It's an intense scene; all of their scenes together are intense - dressing each other down constantly while trying to ignore the electric chemistry between them. Her pale, rosy prettiness and his dangerously intelligent attractiveness made for a great combination that everyone wanted to come together. (While Michael Schoeffling as Jake Ryan in Sixteen Candles was "the IT" when it came to fantasy boyfriends through my high school years, it is now that I see just how hot John Bender really was with all his edgy appeal. Here is a boy who knows what to do with a girl!) When she finally kisses his neck later on in the storage room it's a relief to everyone. This dialogue was more raw and more real than anything any of us had heard before. It thoroughly exploited our teenage fears and hinted that they might never leave us. Ally Sheedy's tearful "When you grow up, your heart dies," was exactly what we all thought at the time. That, and the idea that we would eventually turn into our parents. John Hughes was intrepid in this exploration, going into areas of teen angst we'd never seen. When Anthony Michael Hall's character talked about a gun in his locker, we were all shocked into silence. Today...alas, this is always a little shocking, but no longer surprising. 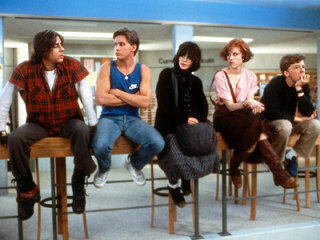 The Breakfast Club is a film that I, and most of my generation, will come back to again and again over our lifetimes. When it first debuted it was simply cool and clever, but it's grown up just like we have. It's writing and nuance is just as electric today as it was upon first viewing, and like an old friend it still offers some surprises every time we hang out. Who would disagree if I dared to call it...a classic?